The Investment Coordination Committee (ICC) of the National Economic and Development Authority (NEDA) has approved the P19.69-billion Cavite-Laguna (Cala) Expressway project, an official of the Public-Private Partnership (PPP) Center said. PPP Center executive director Cosette Canilao said the ICC approved the project in its meeting on Thursday. The project will be submitted to the NEDA board for approval, Canilao said in a phone interview. Public Works and Highways Secretary Rogelio Singson confirmed the approval of the project but said that the NEDA-ICC had sought clarification on the project. “They want us to clarify a few things which, however, should not change the decision,” Singson said in a text message. 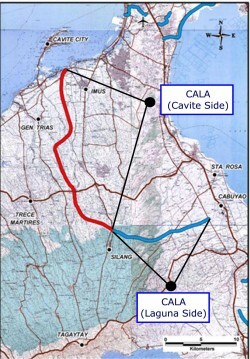 The planned Cala Expressway will link the South Luzon Expressway (SLEx) to the Manila-Cavite Coastal Road. The project involves the construction of two expressways—one on the Cavite side and the other on the Laguna side. The Cavite component is a 27.5-kilometer, four-lane highway from the terminus of R-1 Expressway in Kawit to Aguinaldo Highway in Silang, while the Laguna side is a 14.3-kilometer, four-lane at-grade expressway. The Cala Expressway will be connected to SLEx near Sta. Rosa, Laguna. In the meantime, the Department of Public Works and Highways (DPWH) has yet to publish the invitation to prebid and qualify for the NAIA Expressway project pending the commitment from Philippine Amusement and Gaming Corp. (Pagcor) on the financing subsidy for the project. “Until we can’t have the MOA with Pagcor, we can’t advertise,” Public Works and Highways Director Rebecca Garsuta said in an e-mail. The NAIA Expressway project received the approval of the NEDA board on May 30. The government has so far rolled out three projects under the Aquino administration’s flagship PPP program. The LRT Line 1-Cavite Extension, Operations and Maintenance Project of the Department of Transportation and Communications is currently under prequalification stage. The PPP for School Infrastructure Project of the Department of Education is undergoing the bidding process, while the Daang Hari-SLEx Link Road Project of the DPWH has been awarded to Ayala Corp. in December.